Seeing unripe fruit or nuts on the ground, under your tree, can be normal, or it can indicate a problem. Fruit drop, or June drop, is a natural process which allows a tree to get rid of more fruit than it can support. 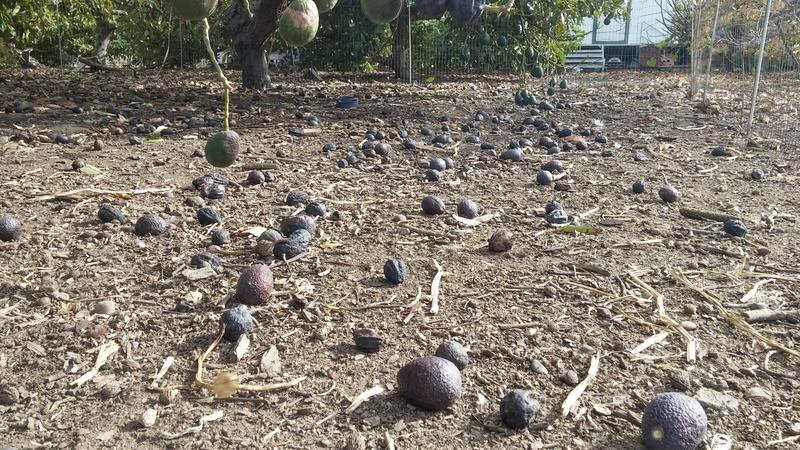 This is common behavior for citrus, apples, avocados, and many other crops. Earlier in the growing season, some trees will rid themselves of unwanted blooms in an action called blossom drop, for the same reason. Some trees, such as loquat, can be messy during this time. Manual fruit thinning works in the same way, reducing quantity, but improving quality. Fruit drop can also indicate insect pests, disease, or adverse environmental conditions. Black scale feeding weakens the tree, leading to wilting, twig dieback, stunting, and early fruit drop. Scale insects’ cousin, the mealybug, can also cause early fruit drop, along with chlorosis and sooty mold. Feeding by mites can also reduce a tree’s ability to support a crop, causing fruit drop. Finally, while weevils are better known for burrowing into beans, cotton bolls, and cereal grains, they also feed on roots, stems, buds, flowers, leaves, and fruit. Often, the first sign of a weevil infestation is leaf wilting, scalloped leaf edges, and early fruit drop. Trees will frequently abort diseased or malformed fruit, rather than investing water and nutrient resources in fruit that won’t reach maturity. Sudden cold or extreme heat can cause fruit drop, especially in young trees. Strong winds can also blow unripe fruit from your trees. The most common environmental cause of excessive fruit drop is insufficient irrigation or unbalanced soil nutrients. This is especially true for almonds and tomatoes. If you need to perform heavy pruning as fruit is developing, the tree may not have the food-producing capability that it had before the pruning job, so fruit drop will occur. Unless it is absolutely necessary, it is far better to leave pruning and tree training for the dormant season. Low magnesium (Mg) levels in the soil can cause fruit drop, as can high potassium (K) or boron (B) levels. You can’t know what your soil’s nutrient levels are without a soil test from a local, reputable lab. While they look convenient and appealing, over-the-counter soil tests are not yet good enough to be useful. I’m still waiting for some aspiring entrepreneur to make that one happen - there’s a huge market for it, but I digress. The type of soil can also have an impact on fruit drop. Sandy soils are far more prone to fruit drop than heavy clay soil. So, don’t panic if your orange tree drops dozens or hundreds of tiny green fruits in May or June. This is normal. Just pick them up and add them to your compost pile. If you notice heavy insect infestations, signs of disease, chlorosis, or wilting, you will want to track down the cause and correct it for a healthy harvest later in the season. And always remove fallen fruit and mummies, to avoid creating a disease triangle, or a hotel for pests.